Many muffins recipes cater for 10 to 12, if not more, muffins. Who eats these muffins? I mean, even a family of four would have at least two to three muffins per person. Are there people out there who have three muffins per day? I find that unlikely somehow. If not, who wants to eat muffins that are three days old? Not that many, I'd guess. Am I totally oblivious to a mysterious muffin culture out there? I started dividing each muffin recipe by two long time ago since have no idea what to do with 12 or more muffins. Since they are thrown together so quickly I don't mind baking fresh ones every other day if necessary. Although these days, I must admit, I often eat 2-3 muffins. 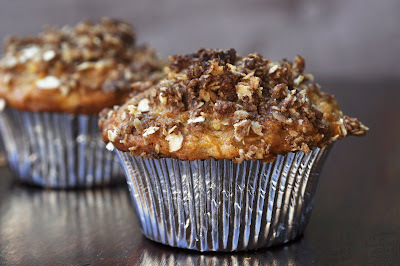 As I am training to run a full marathon in 10 weeks, I crave these muffins after my training runs. To be honest, after all this exercise I chomp them down like little pralines (which they are not). But they are good and just what my body needs: carbs, carbs and carbs to help my muscles recover and get me ready for the next run. Well, this is what I tell myself as I do feel a little guilty after having three muffins in one go. The apple carrot muffins were gone in one day. They turned out to be very moist and juicy. The soft inside with flavors of apple, carrot and raisins were deliciously complemented by the crunchy cinnamon topping. Preheat oven to 180C. Grease muffin tin or line with muffin papers. Combine all dry ingredients and mix well. Set aside. In a separate bowl, combine all wet ingredients. Add dry ingredients to wet mixture and stir until just combined. Gently fold in the grated carrots, apples and raisins. For the topping, combine all ingredients in a bowl. Using your fingers, rub the butter and the other ingredients together until you get a crumbly mixture. Fill the muffin batter into the muffin tin. Top each one with a tablespoon of the topping mixture. Bake for about 20-25 minutes.